Creating a separation between those setting exams and those teaching them could help preserve the integrity of public exams, says a teachers' leader. Malcolm Trobe, of the ASCL heads' union, said senior examiners could be barred from preparing pupils for exams from the board for which they work. 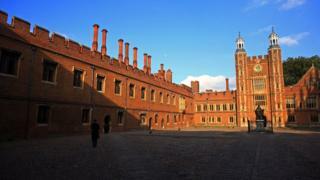 It comes after allegations over exam leaks led to staff suspensions at the leading Eton and Winchester colleges. In both cases the teachers also worked as senior examiners for an exam board. The issue was highlighted by the Daily Telegraph, which revealed Eton College and its head of economics and deputy head of academics, Mo Tanweer, had parted company following allegations that he had shared confidential information about a forthcoming economics exam with other members of staff. The newspaper also reported that Winchester College had suspended its head of art history amid similar accusations, this time alleged to involve pupils being given "advance knowledge" of two exam papers. The school confirmed he had "retired". In both cases, the exams in question were a Cambridge International Pre-U, predominantly taken by private school pupils as an alternative to A-levels. And in both cases, the pupils are not being penalised; instead marks for the exams will be estimated using coursework and/or other papers. Senior examiners are responsible for setting exam questions, while chief examiners are responsible for the whole exam syllabus for exam boards. They are experts in their subjects and work in state schools as well as private schools. Mr Trobe, the deputy general secretary of the Association of School and College Leaders, worked as a senior examiner for many years. He said people who taught qualifications at the level at which pupils were being examined were "far and away the most appropriate people to be setting examinations in these subjects". Where academics had set exams, there had been issues about getting the level and wording of the questions right, he explained. "It is a complex area that needs to be looked at, but it does come back to examiners having a strong culture of ethics to ensure that they do not advantage the pupils that they teach in any way." He added: "It could be looked at - we could come up with a system where a senior examiner who sets the exam for a board is not allowed to teach that board in a school. "There will be senior staff in state schools who set papers as there are in private schools, but we are talking about a small number of people." But the chairman of the Headmasters' and Headmistresses' Conference, Chris King, acknowledged that more teachers who worked as examiners may yet become involved. He told the Daily Telegraph it was down to exam boards to prevent conflicts of interest. Mr King, who represents leading private schools, said the issue had concerned head teachers for some time. An urgent meeting with examination boards looking at whether "sufficient safeguards are in place" is being brought forward. "We need to ensure that senior teachers who take on the responsibility for setting exams are not placed in an impossible position, and the very few who may be tempted to give their pupils too much help cannot do so," Mr King said. Eton College said the problems it had faced with the exam were "extremely unwelcome" and had been taken "very seriously". Winchester College said in a statement that it had treated this matter with the "utmost seriousness", and had worked closely with the Examination Board throughout. "It greatly regrets what has happened. No boy was to blame for the exam irregularity." A spokesman for Cambridge International Examinations said: "Protecting the integrity of our exams is our priority and we take very seriously our duties to ensure that all our examinations are fair, and that all students receive an appropriate and valid grade." The Department for Education said: "Parents and students must be able to have faith in the exam system. Any suggestion of malpractice is concerning and should be looked into. "Cambridge International Examinations board are dealing with the incidents ‎and have made the exam regulator Ofqual aware."